U.S. and UK working together on the multi-phase testing of the AIM-132 ASRAAM and Paveway IV. along the Atlantic Test Ranges. U.S. Navy photo by Andy Wolfe. The United Kingdom’s F-35B Lightning II Weapon Delivery Accuracy (WDA) phase is underway as it conducts F-35B Short Takeoff and Vertical Landing (STOVL) integration trials in the U.S. during spring 2017. Joint U.S.-U.K. test teams from the F-35 Pax River Integrated Test Force (ITF) assigned to the Air Test and Evaluation Squadron (VX) 23 aboard Naval Air Station Patuxent River in Maryland and the F-35 Edwards ITF assigned to the 461st Flight Test Squadron (FLTS) at Edwards AFB, California are successfully testing the U.K. AIM-132 Advanced Short Range Air-Air Missile (ASRAAM), a short-range, infrared-guided missile, and the Paveway IV, a state-of-the-art, all-weather dual mode Inertial Navigation- and GPS-guided bomb. Furthering the collaborative approach of the U.S. and U.K. in the development of the F-35 Lightning II, the U.K. weapon trials are set to continue throughout 2017 with further captive carriage mission system integration work as well as additional WDA events. The U.K. WDA test missions are a final step in the verification of the overall system performance during the F-35 System Development and Demonstration (SDD) phase. The U.K. anticipates achieving F-35B land-based Initial Operating Capability (IOC) in late 2018. The U.K. is the only Level 1 partner with the U.S. on the joint, multinational acquisition to develop and field an affordable, highly common family of next generation strike fighter aircraft for the U.S. Air Force, Navy, Marine Corps, and eight international partners. Its major role in the F-35’s SDD phase is enabling the regeneration of the U.K. Carrier Strike capability, which will result in significant contracts and jobs for U.K. industry as the F-35B Lightning II and Typhoon become the U.K.’s Fast Jet Combat Air Elements of the future. The primary role of the F-35B STOVL aircraft is ground attack with a secondary air-to-air role. 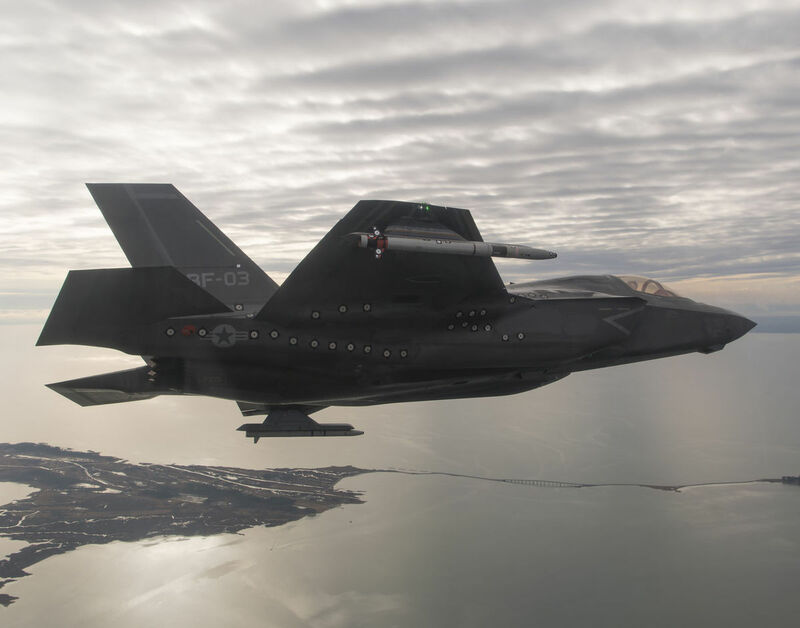 Working on the multi-phase testing of the F-35 Block 3F, AIM-132 ASRAAM, and Paveway IV are U.S. government, military and contractor personnel, U.K. Ministry of Defence representatives, and U.K. industry partners from BAE Systems, QinetiQ and Raytheon Systems Ltd.